Recently I asked my customers what there golf improvement goals are. I was inundated with responses. Naturally the top was hitting the ball longer. But second was hitting more greens in regulation, followed closely by improving the short game. Unless you spend hundreds of hours practicing… your shot disbursement with, say your 5 iron, will be pretty much the same. And the same will be true with your 7 iron and 9 iron. But would you rate your chances of hitting a green in regulation better with a 9 iron or a 5 iron? Obviously you’d have a lot more chance with your 9 iron. It’s a no brainer, you would hit more greens in regulation if you had shorter clubs into the greens. So what is needed to hit 9 irons into greens instead of 5 irons? Generally golfers have about 10 yard gaps between clubs. So that’s 40 yards difference between your 5 iron and your 9 iron. To have 40 yards less into holes, you simply need to increase your swing speed by about 15 – 20 mph. If you swing at 85 mph on average now (which the average male golfer does), then you need to increase your swing speed to 100 – 105 mph. When you do that, you’ll have 9 irons into greens instead of 5 irons. And that means you’ll hit more greens in regulation. You also need to make sure you hit the center of the clubface consistently, have the correct swing path and have your clubface aligned square to the target. Then it’s simply a matter of how to increase your swing speed. Well, there are a lot of different training aids that promise to help you swing faster. The problem with all of them, is that if your body is not prepared to swing faster, then it doesn’t matter what you do, you’ll swing the same speed. Your mind doesn’t like change and is very good at keeping everything the same. So unless you do something markedly different, you’ll probably have the same swing speed. Now what can you do to improve your body so you’ll swing faster? Well, you have…. The problem is, if you just focus on any one of those things, you will reach diminishing returns. For example, if you just focus on flexibility, you’ll get to a point where improving your flexibility will not help you. If you focus on getting stronger, you’ll get to a point where getting stronger will not help you hit the ball further. 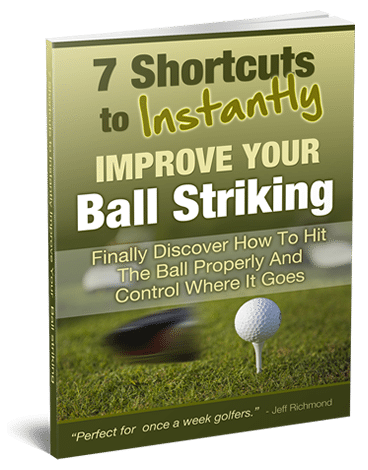 Instead, what you need to do is combine all of the crucial aspects needed for longer drives into your approach. And to help you do that here is the best program I have found. It’s a plan designed by a British sport scientist. 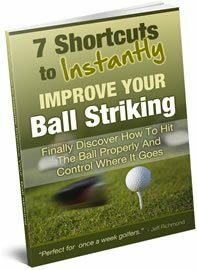 He tested this plan out on himself and added 43.3 yards to his drives in just 56 days, and since then the same plan has helped thousands of others achieve great results too. If you’re thinking you’re too old for something like that, don’t let that stop you. Because it’s all about improvement. Even if you can’t do all of the exercises in this program just do what you can. I’m sure that’ll be more than you would have done without the program. You may not get the same 43 odd yard gains, but you will get gains by just doing what you can. Wouldn’t that still be nice!